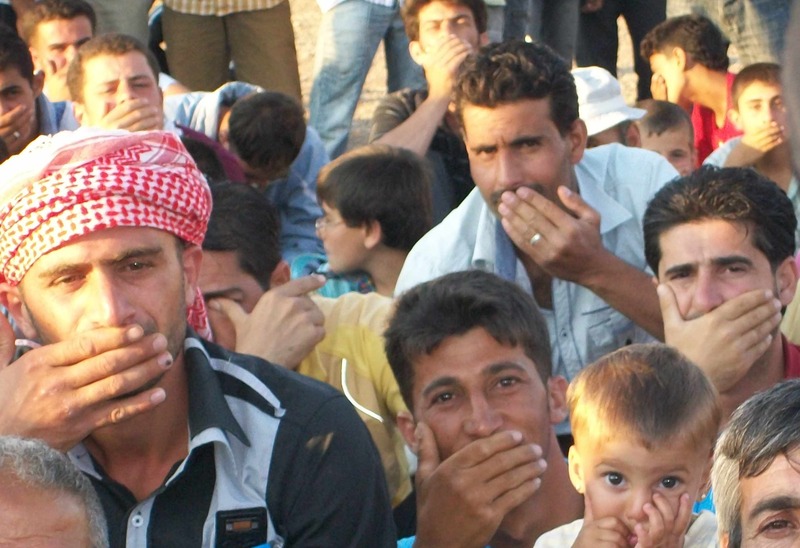 These Syrian refugees are desperate for their voices to be heard. But Turkey doesn’t want you to hear them. This protest after Friday prayers could only be recorded from outside the fence. Journalists are not allowed inside the camp, except during the occassional specially organized media event. The refugees’ chants demand the ouster of Syrian President Bashar Assad. The camp perimeter is patroled by Turkish police so I’m not able to speak to anyone through the fence. But one refugee snuck out of the camp to tell me his story – at the risk of being sent back to Syria if caught. He doesn’t want to use his name. He speaks for an hour about the protests and increasing violence and chaos in his hometown Jisr al-Shughour. During a protest, he said, unarmed demonstrators were shot and killed by the Shabiha, a militia loyal to Assad. Thousands of demonstrators gathered for the funeral, angry at the deaths of their comrades. The Syrian government claims that 120 soldiers were killed by “armed gangs” in what it calls the “heinous massacre” at Jisr al-Shughour. This nameless refugee says the Turkish government doesnt want the world to know the truth about the slaughter of peaceful protestors in Syria. It’s not only journalists being denied access. Refugee and human rights organizations are having an equally hard time. “The restrictions are quite unusually severe, they really are trying to keep whoever they can out of these camps,” says Peter Bouckaert of Human Rights Watch. Turkey is still trying to decide whether to back the Syrian regime or the Syrian nation, according to Syrian opposition activist Omar Al Muqdad. “The Turkish government has a strong relations with the Syrian regime before and now they are trying to make a balance between the Syrian regime and the Syrian nation. So they are trying to stand in the middle of this mess,” says Al Muqdad. At the Turkish Foreign Ministry, spokesman Selcuk Unal denies that Turkey is playing politics in the refugee camps. Turkey is concerned about the refugees’ safety, he says, many of whom don’t want to talk to the media because of well-founded fears of reprisals in Syria. “The security and the order of the camps and all the adjacent areas is also an important issue for us,” says Unal. Unal says there is no reason to think Turkey wants to silence bad news coming from Syria. And he says the Prime Minister’s strong words against Assad are evidence of that. But despite what Unal says, it seems that at the Reyhanli camp residents are eager to talk. I give a small recorder to a refugee to smuggle inside and gather stories. Yusuf Esmail, from Khirbet al-Joz says he was just talking with some relatives back home, and they said they found two corpses with their tongues cut out, so badly-beaten they couldn’t be identified. Reyhanli recently held elections for camp-wide committees. Mahmud Moussa, an earnest schoolmaster from Jasr Al Shagur was elected to the Media council and finagled special permission to talk to a reporter. While camp personnel treat the Syrians with compassion, he says, its the Turkish government’s policy he finds confusing. He’s suprised by the tsimilarities between Syria and the “democracy” of Turkey. Turkey still calls the Syrians in the camps “guests” and not “refugees.” And with protests in Syria expected to pick up now during the holy month of Ramadan, the fine line Turkey maintains between the two sides will get more precarious. The crackdown by the Assad government shows no sign of easing.